Polygonum douglasii is a native wetland species that is found across much of Canada (AB, BC, MB, ON, QC, SK) and the US (AZ, CA, CO, IA, ID, MD, ME, MI, MN, MT, ND, NE, NH, NM, NV, NY, OR, SD, UT, VT, WA, WY) (USDA 2010). In the Illustrated Flora of British Columbia, several subspecies of P. douglasii were recognized. However, the nomenclature for this species has changed. 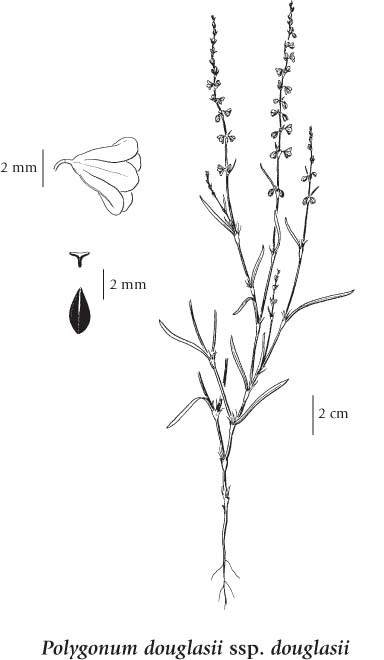 The BC Conservation Data Centre, which determines the official list of BC plants, says: "In 2007, we decided to follow Flora North America (FNA) volume 5 which treats P. douglasii in the narrow sense and elevated the following subspecies as distinct species: ssp. austiniae, ssp. majus, ssp.nuttallii, ssp. engelmannii and ssp. spergulariiforme. This differs from how Kartesz (1999) treats P. douglasii ssp. douglasii in that FNA attributes P. douglasii ssp. johnstonii to P. sawatchense ssp. oblivium. Kartesz 1999 maintains subspecies johnstonii in P. douglasii." (Marta Donovan, personal communication, 2010). Annual herb from a small taproot; stems ascending to erect, numerous, simple to freely branched, 10-40 cm tall. Basal leaves lacking; stem leaves alternate, linear to narrowly oblong, egg-shaped or elliptic, the blades 1-8 cm long, unstalked or nearly so, sometimes reduced to bracts above; stipules short-sheathing, 5-12 mm long, clear, becoming ragged. Inflorescence of few flowers in elongate axillary racemes; perianths 1.5-5 mm long, greenish with white or pinkish margins, 5-lobed nearly to the base. Achenes, lanceolate to egg-shaped, sometimes 3-angled, black, smooth and shiny, 2-4 mm long. Moist to dry rocky slopes and disturbed sites in the lowland and montane zones; frequent in SC BC and on Vancouver Island, rare elsewhere in BC; E to PQ and S to NY, UT, NM and CA.